Note: I do not believe this question is a duplicate of "How to emulate the in-camera processing into lightroom" (I referred to this question in my question) I just want that my monochrome images stay monochrome and my colored should stay in color. shoot photo 1 with Picture Style "Color"
If I import Raw Files into Lightroom, which where shot with the Picture Style "Monochrome", the Thumbnail list in Lightroom shows the correct monochrome Pictures, but as soon as Lightroom starts to rebuild the Thumbnails (not using the jpg sidecar file or the embedded thumbnail any more) it builds the thumbnails from the Color Image, not respecting the Monochrome Picture Style. Of course I can import all images and auto-apply a monochrome Lightroom development setting, but I often switch between Monochrome and Color while shooting, so it would be helpful to extract the information from the raw file and apply different Lightroom presets based on it. How do I start with in-camera JPEG settings in Lightroom? Does not help: I have no process option for "Monochrome". Maybe right (that it is not possible to apply picture Canon picture styles), but I hope that one of you may have a solution or a workaround for the problem. So it would be a solution to import the Photos normal, then filter them by the Picture Style and manually apply a previous defined Lightroom Preset to the result. 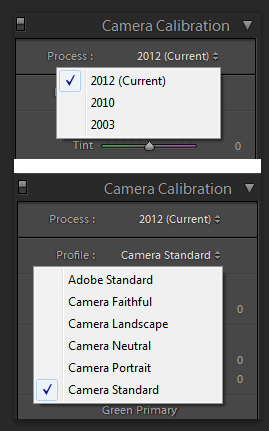 The problem is, that Lightroom does not show this Metadata, so it can't be used for filtering. 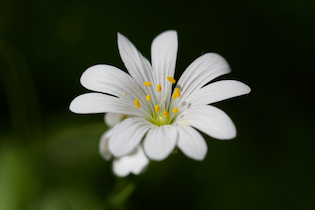 Does lightroom honor my incamera picture control profiles? 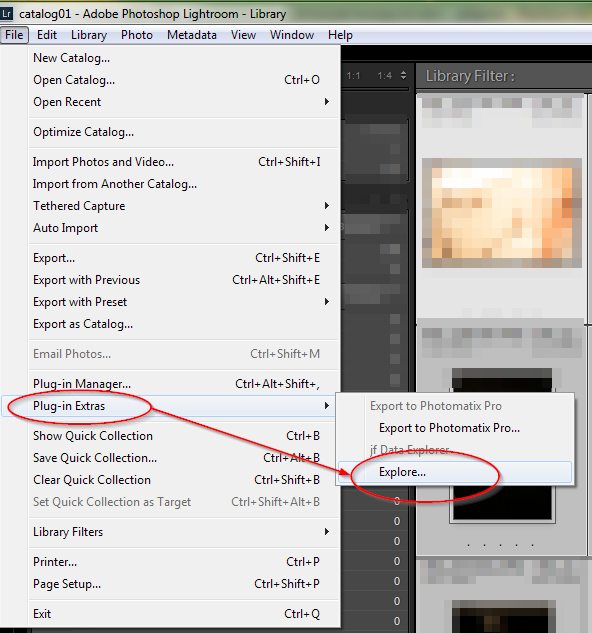 There is a solution provided by Jeffrey Friedl and his awesome Lightroom plugin "Data Explorer". 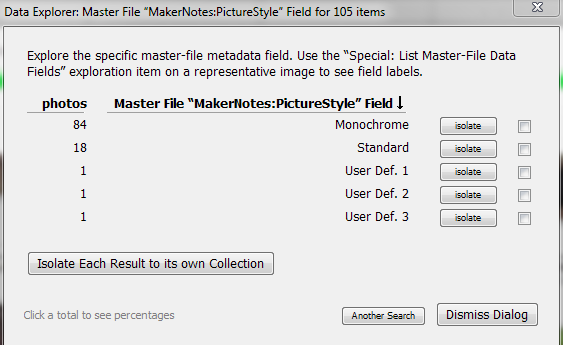 choose "User-Specified Master-File Data Field" in the "Explore" Field and "MakerNotes:PictureStyle" in the "Field" field and press the "Begin" button. Press the "isolate" or "Isolate Each Reslut to its own Collection" Button to get a Collection which have, for example, only the "Monocrom" Picture Style. you are done. all your canon monochrom picture styled images have now a LR B&W preset applied. The problem with doing what you want in Lightroom is that for the most part Adobe products ignore the maker notes section of the EXIF metadata. In fact, if you convert a Canon .cr2 file to .dng, the maker notes are stripped from the file. The maker notes section is where the picture style and most other in camera settings at the time the photo was taken is stored in Canon files. One solution is to open the files using Canon's own Digital Photo Professional software which automatically applies the in camera settings to the RAW file. You then have the freedom to use those setting or alter some or all of them. DPP is supplied in the box with every Canon DSLR and updates can be downloaded at no additional charge. Not the answer you're looking for? Browse other questions tagged canon lightroom raw style presets or ask your own question. Can I save color images while reviewing them in B&W with an EOS camera? 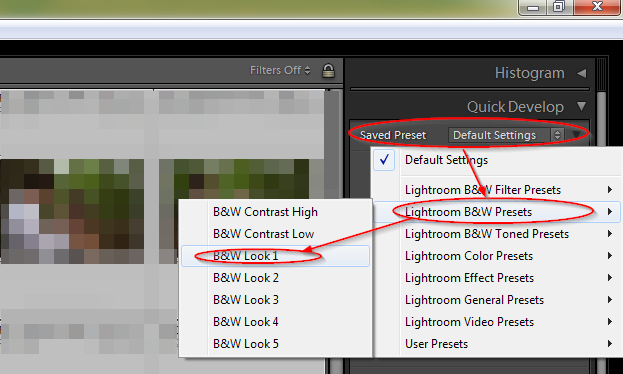 How do I import Olympus E-PL2 raw files in Lightroom 3.3 for Windows? How can I configure Lightroom to use the JPEG from the camera for previewing?